Adobe software are amazing and come with heavy loaded price tag. Adobe is now doing what Microsoft started long back (remember Dreamspark?). Now you can download and use selected Adobe produts for free. This offer is valid for students, faculty and employees of educational institutes. 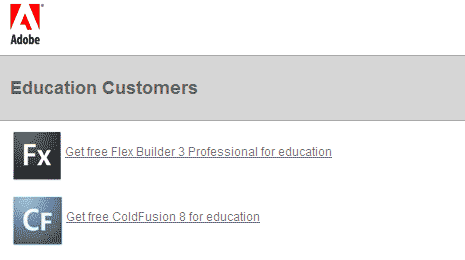 About these products: Adobe Flex Builder is an integrated development environment (IDE) built on the Eclipse platform meant for developing rich Internet applications (RIAs) and cross-platform desktop applications. While ColdFusion is an application server and software language used for Internet application development such as for dynamically-generated web sites.